(Chris) We had purchased our Samos-Patmos and Patmos-Rhodes ferry tickets the day before, so we were set to leave for the Island of the Apocalypse at 7 sharp. Unfortunately, there was a mix-up with the alarms/wake-ups and we found ourselves scrambling to get to the ferry in time. Even though the front desk of the hotel wasn't open yet, we decided to be honest and leave payment anyway. the problem was: The hotel hadn't counted on our honesty and had held on to my passport as security. No one remembered this until we were about to step on the ferry at 6:50am. Dave of the Valiant Memory asked if I had my passport. It was about a 7 minute walk to the hotel, so I knew walking would be inadequate. I ran as fast as I could and arrived to find the desk still closed and my passport nowhere in sight. I woke up one of the guests we had met and she pointed me to the owner's house next door. The owner came to her door in bathrobe and exchanged my passport for the drachmaes and I was off and running again. I arrived at the ferry right about 6:58, but boarding had been held up by a large tour group. Sweating like an Eskimo in Egypt, I settled in for the spiffy hydrofoil ride. The highlight of the fast trip was Dave sticking his head over the rail and being hit in the face with a wave. 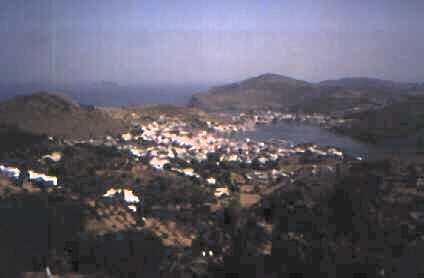 We had arrived in Patmos just in time to catch the bus to the monastery (4.5 km). However, we had yet to obtain grub or a place for our bags. So we did that and caught a taxi to the top of the island. The Monastery of St. John looked big and imposing from outside - it had been a fortress also because of Muslim pirates. However, inside, it was quite cramped and tiny. 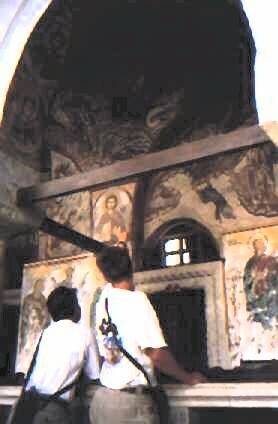 the chapel was very decorative in the usual Greek Ortho style. We were lucky enough to be there when a monk opened the side chapel. 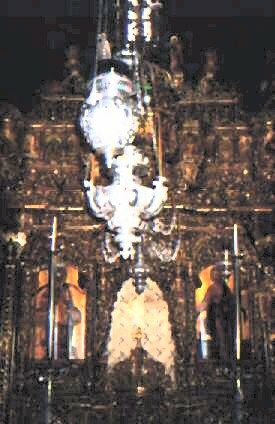 There was the grated silver coffin of St. Christodoulos, the founder of the monastery. You could see the skull - cool. Since he died after the Great Schism, we're not sure if he's a saint in the RC Church. There was another less decorated skull said by the monk to be St. Thomas the Apostle, but we were skeptical. Next to that was a natural rock counter where his assistant Procops would do the writing as J dictated his Revelatory visions. A non-monk (he had the beard and hair of a monk but dressed civilian and we later saw him at the beach) did a 15 minute description of the cave along with a sermon about how we should take the events of our life with a positive attitude. We walked the remaining 2 km to the Skala part of the island and bought some sandwiches and began hacking. (No - the food was good - we weren't hacking up the food! We were playing with a sepia - no not the color sepia - the game - hackey sack, if you will.) We caught a bus to another beach (so much for making this trip more like a pilgrimage! We've been to more beaches than churches - the scars on my burned skin are a monument to our hedonism,) and came to the conclusion that most women should keep their shirts on at beaches not only for moral reasons but also for aesthetic purposes. I took a nap in a beach bed under an umbrella. Dave walked away from almost certain temptations and the others frolicked in the Med. Sea. Back at the ferry area, we played more hack with a 16 year old Californian/Patmosian named Kurt. (Sam) KURT was a home-schooled hacker. He was pretty good. He could stall, gesture (jester), and baby in a cradle. We only condescended to hack with Kurt because we only had ten more hours to wait for out ferry. So we hacked and waited and talked and waited and played backgammon and waited. Chris confirmed our ferry tickets to Rhodos three times but we were still waiting and waiting, never knowing.